Have you just run 26.2 miles, finished a long-term project, or met a personal goal? This week, show us an achievement. I’ve achieved a lot of personal goals in my lifetime. Running 26.2 miles through a windstorm hasn’t been one of them (and probably never will be!) 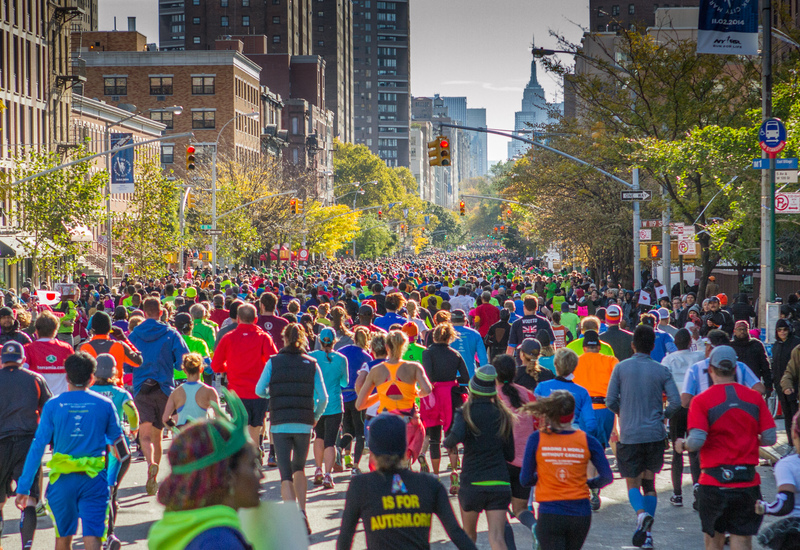 but there are now 50,000 people who can claim it — they ran this year’s New York City Marathon in terrible weather conditions. I headed out last Sunday hoping to catch a glimpse of a runner friend. I missed him at every viewing point I tried, and eventually found myself in upper Manhattan at the point where the course makes a final right turn, leaving the runners with a long straightway down Fifth Avenue to the finish line. Hauling myself as far as I could up nearby a fence for a better vantage point, I snapped a shot of this mass of people — who by this point, have run 23 miles or so — heading down the homestretch. Most of them were exhausted but jubilant. Spectators lined the length of Fifth Avenue, calling out encouragement or offering water, snacks, and high-fives. Few of them — nor I — knew any of these runners personally, but that didn’t matter. These athletes had achieved something huge, something that took training, dedication, and a not insignificant amount of pain. The least we could offer in the face of their achievement were some kind words and bananas. This week, show us a photo that says “achievement” to you: people meeting a long-worked-for goal. Something tangible you’ve created. A view from a journey you’ve completed, or the stating point of a journey not yet made or a project you hope to finish. We look forward to being inspired! This is a terrific topic! Thank you Michelle. well done, that’s really fantastic and you should be proud of it!!! Wow , I love the colors of the picture ! aside from being technically perfect, you also captured the priceless expression on his face as he finds his balance on the skateboard — exquisite! My second post for the Weekly Photo Challenge: Achievement is… my mom’s home-made birthday cake at her 75th birthday!!! Love this challenge. I have just the photos. I’ll be right back. That is an absolutely fabulous photo, Michelle! The act of achieving something…I’m sure i’ll find it somewhere. Gracias for the chanllenge! This is my 100th blog post. That is an achievement, right? I really want to do the challenge but I do not understand ho to do the pingbacks. I read up on it and the instructions but still do not understand. Do i start a new post and hit text than past it in my post? Im sorry I am trying to figure this whole site out but is not easy. Add this link to your post https://dailypost.wordpress.com/dp_photo_challenge/achievement/ or highlight a word in the editor and click on ‘insert link’ then paste it into there. You can either drop the whole thing into your text, or highlight a word and click “add link” as @Ambitious_Drifter suggests — either is fine. Very cool topic, thank you for the idea! I am actually showing a future achievement, located in Hamburg, Germany. Hope you’ll like it. What a great shop and terrific theme! Shot I meant, what a great shot – the colors are extraordinary. Michelle, why my post doesn’t show up on the list of responses? I had the same problem with the daily prompt yesterday. I tried and tried but until now it is not showing. I link the way I always did in the past and it worked till yesterday. What I am doing wrong? Can you please help me? You too? Comforting to know that I am not alone. Thanks for letting us know. This happens with some regularity, and our developers are trying to figure out why — it helps to know when. From what I have read it seems part of the problem may be that my url is https, does this sound likely, and if so how can i cage it back to http? I’ve tried the support forums but can’t seem to find a solution? A tough one Michelle, but mine was overcoming a fear! Love this post! im doing my first 5k run tomorrow morning which doesn’t seem like anything compared to this, but hopefully I will achieve this distance myself one day. Here is my entry for this week. Have a wonderful weekend everyone! 466 Responses While this challenge is closed to new entries, we encourage you to visit the Reader to find other avid bloggers. psychologistmimi Soaring to New Heights Like the Birds in the open-land: But what does it mean? Better Than Reality Go Cougars! Michelle Lunato Photography Achievement. It was Late at Night and Dark. readsbyredriverbanks And then there were five (soon!). JKT Brad I Believe I Can Fly! Words & Pics I did it! So Not Simple © The Crazy Things I Do..
Melanie Ryding – Ryding2Health BLOG Could you represent your greatest achievement in one photo? Tales of a slightly stressed Mother! Bake off. PURSUIT OF HAPPINESS The greatest achievement! An Upturned Soul The Achievements of Others… Do you envy, admire, are challenged or inspired by them? The Seeker Whatever Stella wants, Stella gets! For our tomorrows Remembering heroes of yesterday, helping heroes of today..
the 555 challenge Achievement #1 … the vest’s virgin outing, and no chafing! scottseyephotos Weekly Photo Challenge: Achievement – $ 74,880/36 year Surprise!!! SuyashChopra Celebrating the Achievement, Together…..!!! Light Words Making Yummy Food Creates Big Smiles! Free Carnation Achievement, and feeling proud. They, You and Me Achievements…my very own. The Ring Lady Achievement: Who said men can’t go to Mars? Minding My P's With Q Photograph – Peas and Arugula…Oh MY! my photography blog cafe sybille. Osyth Climb every mountain …. Life in the Foothills Achievement – The WordPress Photo Challenge! Lucid Gypsy Overcoming a Fear . . .